It’s been awhile since I completed a blog post… so much has been going on and keeping me busy, I’ll reveal a BIG surprise soon (stay tuned!)!! The weather is getting chilly- so today I decided to make some comfort food-ground chicken pot pie. First time making this and my stomach is rumbling from the delicious aroma that has taken over my home! Add the oil to a pot set to medium heat. Dice up the onions and add to the pot. Sauté until golden in colour. Then add the frozen vegetables to the pot. I prefer small cuts of vegetables so I used diced carrots, green beans and peas. Add salt and pepper to taste-I used about half a teaspoon salt and 1 teaspoon of black pepper. Sauté the onions and vegetables together for 3 minutes. Mix well and cook for 10 minutes, stirring every so often. Once the meat is cooked, turn the stove to a lower setting allowing the excess liquid to evaporate. [I let mine simmer for another 10 minutes]. Spray or brush each ramekin with oil. In each ramekin-place a circle of the dough and press it along the sides of the dish. Add a couple of tablespoons of the meat mixture to each ramekin, covering the puff pastry at the bottom. Take a handful of cheese and place on top of meat. Place the second puff pastry circle on top and using your hands or a fork, press the dough into the sides of the dish. Poke a few holes with a fork in the puff pastry to allow steam to escape. Brush each top of puff pastry with the egg mixture to get a beautiful shine. Continue step 1-6 until all ramekins are done. 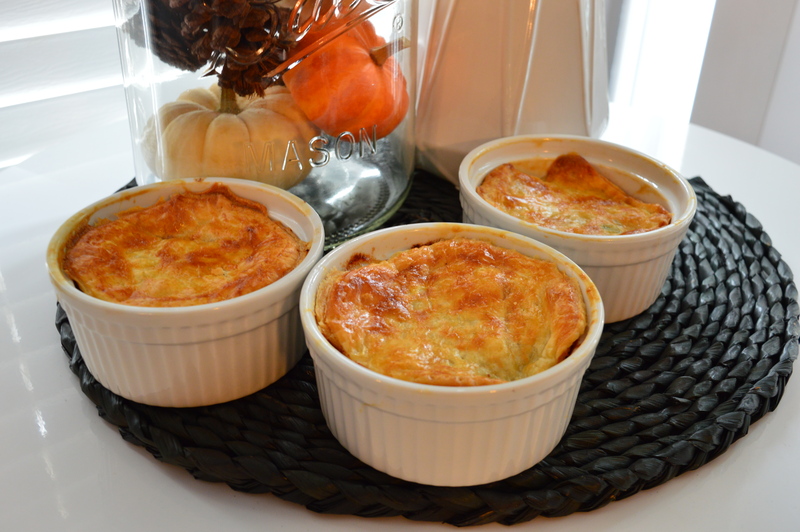 Place the ramekins on a large baking sheet and then on the lowest cooking rack, place in the oven. Cook for about 15 minutes. Take a fork and test the top of the puff pastry, if it comes out clean, the pot pie is done. A golden crispy top is another way of knowing they are ready. Allow the pot pies to sit for 5 minutes before serving.